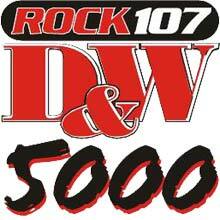 My favorite radio duo, Daniels & Webster, are celebrating their 5000th radio show today. Research performed by the Times-Tribune and Shamrock Communications has thus far failed to find another duo that’s worked together at the same radio station for as long as Daniels & Webster. That’s awesome! I used to listen to them every morning on Rock 107 during middle school and high school, and I tape recorded a lot of their skits. In fact, when they released their compilation CD “Wind Beneath My Seat” in 1999, I already had a lot of the material in my personal collection. Congrats guys! Oh, and hopefully I’ll be getting their fourth album today, “Sgt. Lumpy’s Auto Parts Club Band“.